The better question would be what, and not who, the rapper Future is. Collecting a list of Future descriptors could be its own hobby: He’s a “bleeding cyborg” as The New York Times once labeled him, “spitballing weirdness” as Pitchfork said, and “the voice of hip-hop today,” as the Times argued in another recent feature. He makes “alien dreams”; he’s the Heinz in a “ketchup aisle that grows ever more crowded by the day.” The introduction to his latest mixtape, F.B.G. : The Movie, might offer a hint: He emits a series of sounds that devolve from simple braggadocio (“swagger on me…money on me”) into an almost incomprehensible list of words (“presidential…fifth war…fish scale…Gambino”), a celebration of unintelligibility. 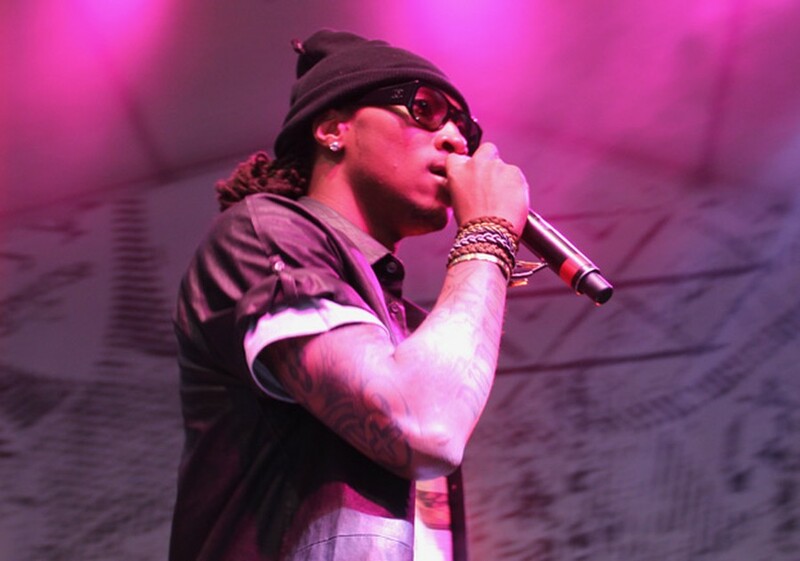 Formerly the oddball of popular rap music, Future has turned his trademark catalog of auto-tuned croons, vocal jabs, and raspy exclamations into a full-fledged powerhouse, dominating rap radio, releasing critically acclaimed albums, collaborating with Kanye West, and opening for Drake’s recent arena tour. He performed a breezy 50-minute set Sunday night at Concord Music Hall, just six days after he and his fiancée, the pop star Ciara, announced the birth of their first child—a boy named Future. The first thing to notice is the voice. Future’s cadence is the musical equivalent of deckle-edge paper: coarse, gruff, elegant, and almost comforting. To trace the modulations would be foolish—there’s too much going on to map the inflections. At the show, he avoided much of the warping he employs on his records, using background vocals and the weight of his natural voice to create the necessary emphasis. With “Tony Montana,” a breakout song with Drake in which Future’s words sound like they’re being sewn together mid-sentence, he traded the special effects for more enunciation. During “T-Shirt” and “My Momma,” two of the most clamorous songs on his recent studio album Honest, he sounded as if he were vomiting the words into the microphone. The “My Momma” performance made use of aggressive strobe lighting, and was paired with blasts of smoke that enveloped the rapper. During “T-Shirt,” Future’s eyeballs looked ready to pop out of their sockets; his desperate “See how persistent I am?” plea at the climax of the song had the same irresistible fanaticism in person as in the recording. Future’s use of auto-tune isn’t a maneuver to obscure his regular voice as much as a tool to inflate its urgency and soften its edges. He’s one of the few artists who’s figured out how to make auto-tune sound both insistent and forlorn. Like on Kanye’s breakthrough album 808s & Heartbreak, there’s a way to techno-croon without nettling vocal purists. His rendition of “Bugatti,” a song on which he delivers a mammoth, heavily auto-tuned hook, was so forceful that a friend turned to me mid-song with a look of complete astonishment. Future’s sound achieves an unparalleled strength: His performance of “Covered N Money” at Concord (elegant song titles have never been his forte), another roof-rattling song from Honest, demonstrated why his music has been an unrivaled presence on rap radio the last few years. Future’s wordplay—if it can even be called that—is a version of free association. Videos of him working in the studio show him walking into the booth and blurting out as many words as can fit in the crevices of his beats. His words and sentences are constantly rearranged in such a way that he can flip intonations mid-word, or use different voices in the same sentence so that his words sound like they’re melting into each other. His lyrics aren’t documents to be studied: There’s no “message,” no “narrative” to design, no “wisdom” he hopes to impart. There’s no sanctimony or didacticism. He can be refreshingly frivolous. That doesn’t mean his music isn’t as challenging as some of rap music’s most forward-thinking material: Future can be as serious an artist as Drake and Kanye West. He mines his own insecurities with just as much acuity. His performance of the pop hit “Turn on the Lights” was genuinely affecting, and even the dizzy title track of Honest was done with some warmth. He ended the show with “Blood, Sweat, and Tears,” the final song on Honest, but his execution was pandering. There are other artists who have sprouted in his mold: Rappers such as Young Thug, Rich Homie Quan, and Migos, and producers such as Mike WiLL Made It, Metro Boomin, and Sonny Digital are part of a Future-inspired Atlantan rap collective that has given new life to Southern hip-hop. For a genre that’s always been attached to its beginnings, this group has effectively moved rap music away from its lyrical, textual origins to a place where the primary concern is making music that simply sounds really cool—an honorable and much more difficult task than rap’s gatekeepers would admit. Few artists aside from Future have had more say in making rap music progressive, in making it tuneful, pop-ish, sentimental, thundering, and weird. Yet the central problem Future encountered on Sunday is a common one with live rap nowadays: With a feature-heavy discography, it’s hard to do a full show without any corner-cutting. He blazed through his features on “Tapout,” “U.O.E.N.O.,” and “Bugatti” so quickly that he forgot to compensate for them later in the show, when he could have committed more time to full-length songs from Honest. He opened the concert with “Chosen One,” a little-known song from F.B.G. The Movie, then made an uneasy transition into what could be his strangest, most inventive rap single of the last few years: “Karate Chop.” Some of his more mercurial work, like “Sh!t,” involved Future shouting a sequence of gibberish in unison with the audience in what turned out to be a comical exhibition of confused crowd solidarity. For someone so committed to his craft, he was inexplicably cavalier with his delivery and song selection. Future always has a lot to say; he just never likes to spend much time saying it.